As the G4 Alliance plans to discuss safe and affordable surgical care at the 70th annual World Health Assembly this week, a leader at the company, fresh off a trip to the continent, shares why it's a topic that resonates at Johnson & Johnson. A few weeks ago, I had the unique privilege of traveling to Africa to meet with Johnson & Johnson employees, government officials and other stakeholders in Accra, Ghana, and Johannesburg, South Africa. While I travel frequently, it is always a great experience to see the work of our international employees and partners firsthand, and to see our company Credo in action. My visit to one of those partners, the Medical & Surgical Skills Institute (MSSI) in Ghana, was one of the highlights of my trip. According to data from Vanderbilt University Medical Center, 5 billion people—particularly in low-income and lower-middle-income countries—lack access to safe, affordable surgical and anesthesia care. And while Ghana, on average, does better than most countries in making surgery available to people who need it, it’s always crucial to keep training new health workers to help maintain the skills of people working in surgical settings. In fact, ensuring that more people around the world have access to essential surgical care is a major component of Johnson & Johnson’s commitment to the 2030 UN Sustainable Development Goals. To date, more than 10,500 healthcare providers have received critical skills training from MSSI, which gets supplies and funding from Johnson & Johnson. 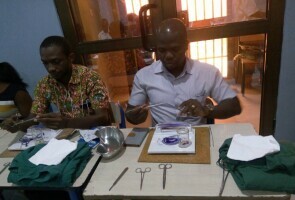 For more than 10 years, the company has partnered with MSSI to provide life-saving surgical training to doctors, nurses and other healthcare providers in Ghana and throughout sub-Saharan Africa. To date, more than 10,500 healthcare providers have received critical skills training from MSSI, which gets supplies and funding from Johnson & Johnson. During my visit, I was able to observe a suturing class for nurses and midwives who came from all over Ghana, including many rural areas outside the capital of Accra. Their commitment to learning was clear: They were excited to improve their skills in a hospital setting, and looked forward to returning home to better serve their patients and share what they'd mastered alongside other nurses and midwives. All over the world, the Credo is a force for good, driving us to ensure we make a difference in the communities in which we work around the world. My trip confirmed for me that Johnson & Johnson has an exciting opportunity to grow in sub-Saharan Africa and meet the significant burgeoning surgical—and overall healthcare—needs there for years to come.